Demonstrators blocked several roads in Catalonia Tuesday to protest the arrest in Germany of the region’s former president Carles Puigdemont and the jailing of other separatist leaders in Spain. Regional road transport authorities said traffic was closed Tuesday morning on the A7 motorway near the French border and the national N340 that links Catalonia with Spain’s southeastern coast. But other main roads remain blocked. 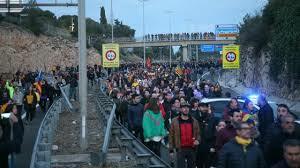 Protestors had gathered before dawn to stop traffic on the main motorways linking Spain and France. The demonstrations were called by the CDR – the radical Committees in Defence of the Catalan Republic with the hashtag #PrimaveraCatalana – Catalan Spring – and with signs calling for “freedom for political prisoners”. “With the latest jailings and the arrest of president Carles Puigdemont, it seems clear that we have crossed a point of no return,” it said in a statement on Monday announcing a wave of protests. The roadblocks came as Puigdemont spent a second night in a German jail where he is on remand while Germany considers Spain’s extradition request. On Sunday thousands took to the streets of Barcelona to protest his arrest resulting in violent clashes with police.